Helpful Tips to Keep Your Family & Home Safe! It’s a grim statistic and one I don’t enjoy sharing with people. But I think it’s important to be upfront with homeowners. It often sobers people up to the dangers within their home. Someone dies roughly every three hours due to a fire, according to the National Fire Prevention Agency (NFPA). That statistic isn’t surprising considering that a home structure fire is reported every 85 seconds. Fire-related facts like these encourage us at Powell and Turner to observe National Fire Prevention Month every October. In fact, we feel that fire prevention is so important and so overlooked; we celebrate it the entire fall season. We’re hoping maybe we can stop a fire and save at least one life. So many residential fires occur when the weather begins to turn colder. Here are three of the most common devices that start fires in homes. You likely have at least one in your home. If so, this is valuable information to consider. Space heaters are a common quick-fix idea, and they’re probably the most dangerous. Two out of three fires and three out of every four deaths are caused by space heaters. Fireplaces are often used for supplemental heat. Actually, they do the opposite. When lit, they draw the warm air that is inside up and out through your chimney and make your furnace work harder. But a crackling fire on a cold winter night is a good for your soul. Just make sure you have your fireplace checked out and cleaned before you use it. Here’s a quick check you can do yourself. The damper should be tight. Close it, and look up through your chimney. If you see daylight, have it fixed. Hire a chimney sweep to remove any obstructions such as birds’ nests and thoroughly clean the flue. Creosote is an unavoidable byproduct that builds up in wood-burning fireplaces and can catch fire. If you use artificial logs, burn only one at a time. They’re made of wax and sawdust and may explode if used in multiples. Never burn pressure-treated wood. It contains toxic chemicals that can make you sick. And of course, never leave a lit fireplace unattended. Wood-burning stoves need close attention. Follow the manufacturer’s directions by never burning coal or pressure-treated wood in your wood-burning stove. You should also never burn artificial logs—the intense heat can cause them to flash and explode. Never start your fire with gasoline or any other liquid fuel. 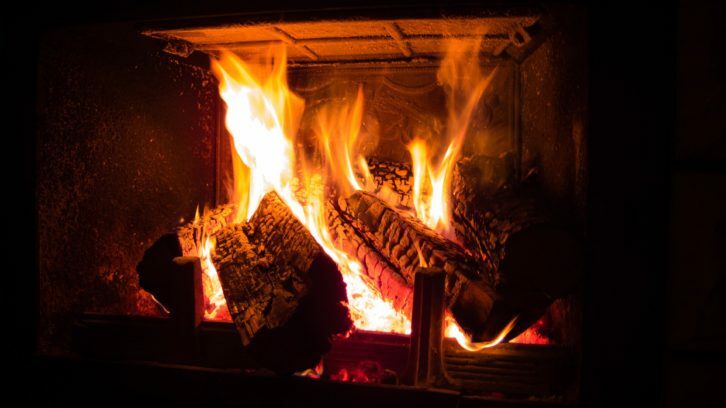 Also, keep in mind that wood-burning stoves require the same maintenance as fireplaces, so check the damper and vents and have them cleaned annually. Whether you use space haters, have a fireplace, or own a wood-burning stove, you absolutely should have smoke and carbon-monoxide detectors throughout your home Your smoke detectors should be tested at least once a quarter, batteries changed twice a year, and replaced every 10 years. Did you know? Smoke detectors expire after 10 years and cannot be counted on to work! Carbon monoxide is a deadly, odorless, tasteless gas that your body absorbs 200 times faster than oxygen. Gas fireplaces, stoves, barbecues, propane appliances, and automobiles are possible sources around the house. Don’t rush it—at best, it will make you sick and at worst, it will kill you. There are no warning signs other than a detector. Be sure to get a carbon-monoxide detector on each level of the home. Fireplaces, space heaters, and wood stoves are great for ambiance and winter holidays, but if you feel like you absolutely need one to stay warm, that’s a sign that your heating system is not operating properly. A fall tune-up on your system can help spot any reasons that your system is not running efficiently or even check to make sure your heat exchanger isn’t cracked. A cracked heat exchanger is the main culprit for carbon-monoxide leaks.